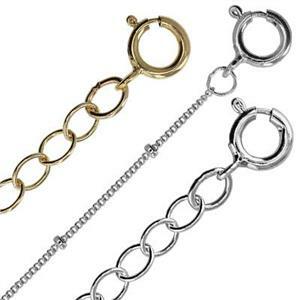 Gold filled and sterling silver anklets made from high quality jewelry chains. Huge selection of necklace chains for your jewelry making business. 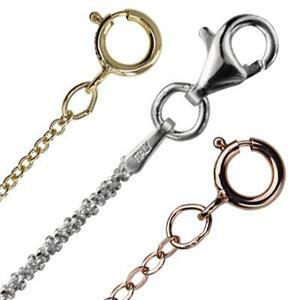 Jewelry chain footage lengths including a huge selection of silver chains and more! Shop bulk spools of jewelry chain or finished lengths for making necklaces, bracelets and anklets. Halstead is known for our huge selection of sterling silver and gold filled chain, but we carry other metals as well such as 14 karat gold and copper. 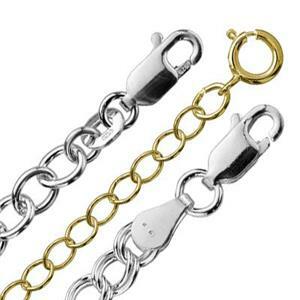 Bulk chain by the foot is sold in 12 inch minimum quantities unless a 10 foot minimum is noted. Spooled lengths are often segmented at the factories so we cannot guarantee continuous lengths of any specific measure. Please use common sense when selecting chain. Precious metals are malleable and lightweight options may stretch or break when used for oversized pendants. 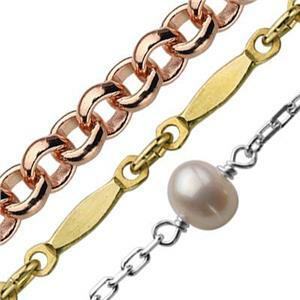 Visit our Jewelry Chain Info page to learn about this important component category. 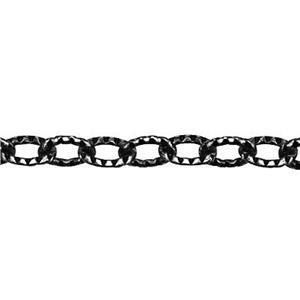 Our Jewelry Chain Glossary of Styles article is a useful reference on the differences between chain link styles. Use the filter options to the left to narrow your product listing results. 2.3mm Oxidized Textured Chain. Darkness will vary.